This is the perfect side dish for all of your Mexican favorites. It is so fall of flavor, nutrients and yumminess. It's also a great dip with tortilla chips! I have come to a few conclusions. The first: every weekend should have three days! It is amazing the difference that one extra day makes. The second: Tuesdays after a Monday off are the strangest. Is it Monday? Is it Tuesday? What should I be doing with my life? What they heck happened on Friday (which seems so long ago now) and what loose ends am I supposed to be tying up? Don't get me wrong, I am super grateful for the extra day and all of the quality time with friends, family and especially my little Jax... but it does make for an extra hard reboot when it's over! Of course none of that has anything to do with this salad. The inspiration for this salad came from my sister-in-law, Jess. She sent a recipe along with the instructions for her chicken enchiladas. I made a few changes to match our tastes and the ingredients we are more likely to have on hand. Which is delicious, by the way. 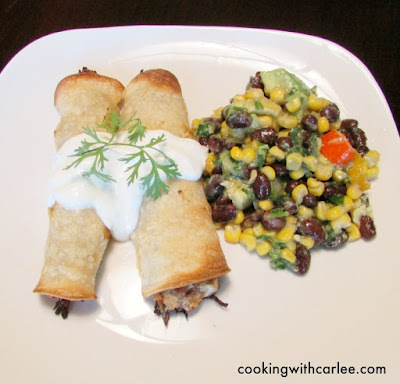 I made it to go with some pulled pork taquitos and it would be great alongside tacos, enchiladas, burritos and the usual suspects, but it would also be great served with a great piece of grilled chicken or a pork chop. Heck, I liked it so much that I took a bowl of it on the road with me the next day and had it for lunch. 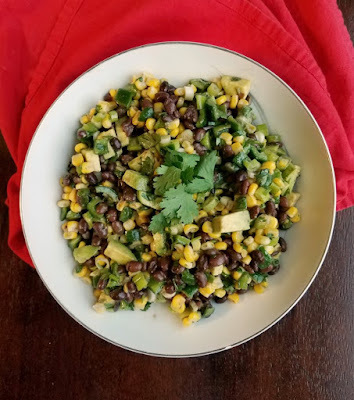 That's it, corn, black bean and avocado salad a fork and a big glass of water. I was happy as a clam. This is also great as a dip. Just spoon a nice pile on your plate and grab some tortilla chips and you are in business. It's a great snack, starter or tailgate food as well! Jax was a little disappointed to find bits of green stuff (cilantro) on his beloved avocado. He would prefer a half an avocado and a spoon. So next time I make it, I'll have to reserve some plain avocado for him! This recipe is huge, so it would be perfect for a family gathering or would make an excellent potluck dish. If you are making it for a small family, just cut it in half! In a large bowl, quickly stir together garlic, salt, cayenne, sugar, olive oil and lime juice. Add beans, corn, peppers, green onions and cilantro. Toss in dressing, then cover and chill for at least an hour but as long as overnight. Stir in avocados just before serving. Best served at room temperature. Nope, not just you, where did Friday go?? Mmmmm good! I love a salad packed full of healthy goodness but with great flavor!! This looks so pretty too!! Thanks, Andrea! It really is pretty darn good, if I do say so myself! That one day really DOES make a huge difference! But yes, I'm always so thrown off for the rest of the week. This salad looks great - perfect summer side dish or definitely for over chicken. Even just with chips as an appetizer - YUM! Oooh, now you have me wanting to make another batch to eat with chips! I was thinking earlier it would be great over a bed of lettuce with some chicken as a tex-mex salad also. You wouldn't even need dressing. WOW! My mouth is watering right now. Gimmie a fork! This sounds like a perfect side dish to go with my favorite Mexican food. I think I could eat Mexican every day if my husband would let me! I could come close... but I'd miss Italian food and BBQ! This looks great. We call this cowboy caviar at my house. Love this for parties. I have heard it called that before too, it's delicious no matter what you call it! Thanks! This is my kind of salad! Sounds great! Mine too! It really is delicious! Oh yes! This sounds yummy and perfect for me! 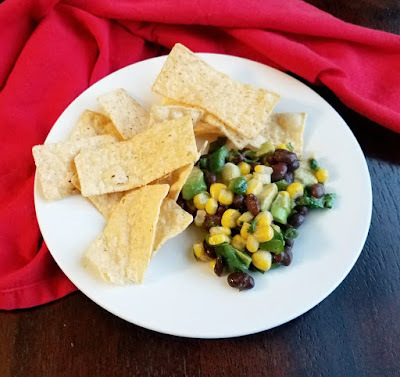 I love corn and black beans together, but then you go and add avocado? Boo yah! I'll be trying this for sure! Short weeks are the longest!! (But totally worth it for that extra day of weekend!) This salad is amazing. I really hope you give it a try! 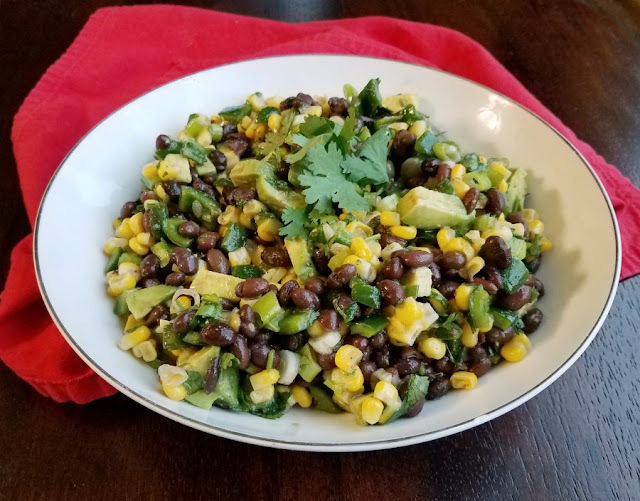 One of my favorite summer salads! Thanks so much for sharing with Full Plate Thursday and have a great weekend! Mine too, thanks Miz Helen! Hi Carlee, this does sound like a perfect summer side dish. i bet the longer it sits the tastier it gets (up to a point!). It really does! It was super good on day two, though I imagine the avocados could only go so long before they end up brown mush! What a lovely salad! I bet it was perfect with the taquitos! Hope you had a great weekend! It really was, thanks Mollie! I hope your weekend was lovely as well. Carlee, we make this all the time in the summer - It's one of our favorite things! It makes such a perfect appetizer. Pinning! Thanks so much for linking up at You Link It, We Make It, hope to see you back tomorrow! Isn't it so good? Thanks so much, see you tomorrow! This looks amazing! Thanks for linkin' up with What's Cookin' Wednesday!